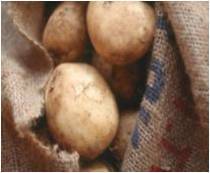 The South African potato industry contributes over 2% of the gross value of agricultural products in the country, generating R2.5 billion per annum. Potato production is the core economic activity and employer in the Sandveld region, producing an annual turnover of R400 million and employing 3 250 people. High input costs and challenging farming and environmental conditions make maintaining a viable enterprise difficult for farmers in the area. The Sandveld is the second most highly threatened ecosystem in South Africa and the core potato production area coincides with the Greater Cederberg Biodiversity Corridor (GCBC), an important ecological corridor in the heart of the Cape Floristic Region biodiversity hotspot. The region is home to 58 rare and threatened plant species, 30 of which are endemic (found nowhere else), and 6 endemic vegetation types. About 6 600ha of potatoes are planted in the region annually, placing significant pressure on biodiversity, through clearing of natural vegetation and intensive irrigation. The five year rotation cycle required to combat the impacts of soil-borne diseases means that the industry crop footprint is considerably larger than just planted areas (45 000ha in 2010). In response to this threat to biodiversity, a partnership between producers, retailers (Woolworths and Pick ‘n Pay), government, the national industry body (Potatoes SA) and Conservation South Africa formed The Sandveld Biodiversity Best Practice Potatoes Project in 2007. Members receive a guideline, an environmental management plan and extension services and an audit (although the services and auditing has now ceased). The guidelines comprise advice on biodiversity management and planning, irrigation, fertilizer use, soil management and integrated pest management, and also contain a pre-audit checklist, which allows producers to measure their compliance voluntarily. A three-tiered system will allow producers to achieve either a participant, gold, or platinum status, depending on adherence to the legal requirements and a percentage score in terms of the biodiversity criteria. The minimum requirement is full compliance with national legislation on permits for ploughing and water abstraction. This level is not regarded as best practice, since best practice entails additional action in favour of sustainable production and biodiversity conservation. Research into efficient irrigation has been conducted in collaboration with Wageningen University. Note: In 2010, the initiative had 29 members. However the project no longer has a leader and the viability of the initiative is uncertain. Illegal land and water use in the area remains a serious concern, and the industry has engaged with government on how to address this.